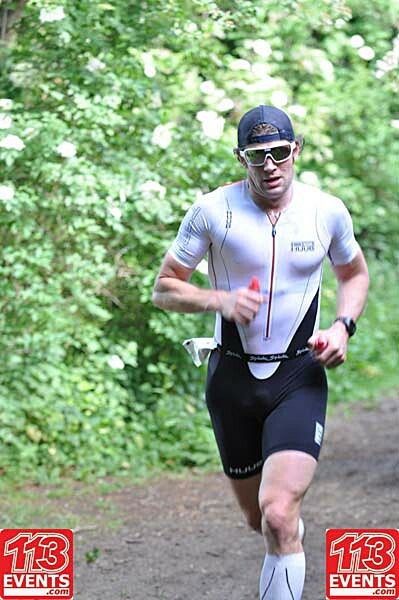 4 middle distance triathlons in 36 days – THAT WAS THE PLAN! If you average it out, that works out as one middle distance race every 9 days. It takes your body 10 days to absorb any training, so there isn’t really any beneficial training that can be done to improve fitness between races. There isn’t really enough time to absorb the overload from the previous race before you do the next one! In fact, if you look at this idea on a ‘micro scale’ with the sole purpose to perform at your very best in every race, no part of this is a good idea. It is more than probable, that performance would deteriorate a little bit in every race, leaving the athlete wasted at the end of the process with little to show for it. At least that is one way of looking at this ‘idea’. But there are always two sides to every coin. So here is the ‘other side of the coin’. The plan for the Bedford was to get some race practice in. Test out nutrition, race kit and get a feel for ‘race pace’. Mostly importantly, dial the effort back just a few % on the bike and NOT push on the run. This would give me a pretty good idea of ‘race pace’ and hopefully allow me enough time to absorb the race having not given it 100%. Of course I wanted to win, but if this run of races was going to work in my favor I would need to be strict about this. With two weeks between Bedford and Bala, assuming I had got pacing right in Bedford, this would allow me enough time to recover, make any necessary kit and nutritional changes, and build into the Bala race. This time, hopefully increasing to full gas ‘race pace’. Next up…. And only 7 days later – the Cotswold 113. This was the only real question mark race I had entered. When I say question mark, I mean I was really not sure if this was a good idea. Bala was my main focus of the series. It was the one I really wanted to nail. So the Cotswold 113 was a bit of a ‘gamble’ race. Over the years, on a number of occasions I have put in some of my best performances or training 1 week after my ‘A’ race of the year. 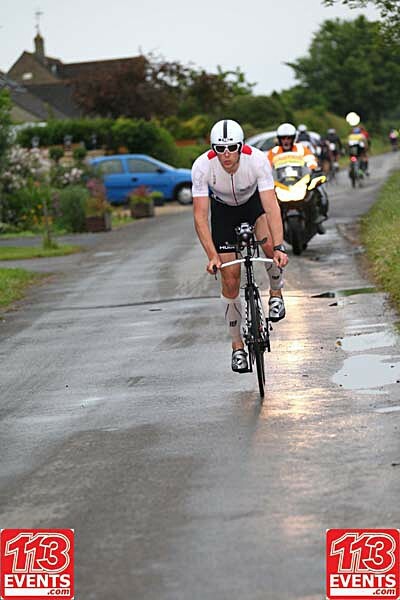 Back in 2011, I clocked 1hr 47mins for a 50mile TT one week after my first ever sub 9hr Ironman. Sometimes your body just surprises you. So, I had entered this race with the hope of being surprised. 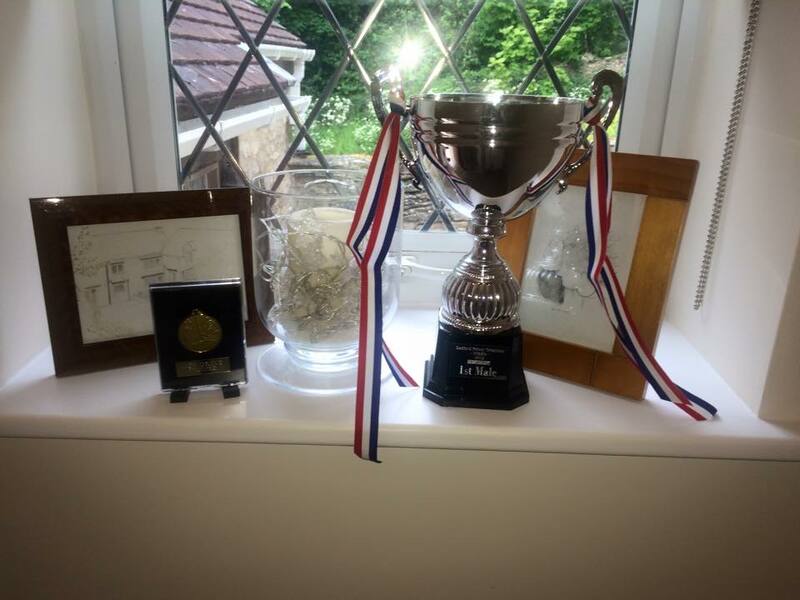 You never know…..
After that I had another two weeks before the final race, the Grafman. Now this was what I was hoping would happen. My body would have absorbed the 3 almost back to back races and I would have moved my fitness up another notch. I would have also learned a lot about where my limits were at this distance and be able to execute a near perfectly paced race. This was ‘THE PLAN’. How it turned out? Well it is a bit of a long read but bear with me. The race in Bedford was an interesting day to say the least, with a multitude of navigational mistakes on my part. People who know me will probably not be surprised to hear this. Anyway, I felt pretty good in the swim. I was not able to stay with the lead swimmer, but led the rest of the field around the course. I came out of the water a minute or two behind the leader only to be told that I had missed a buoy and to be sent back in the water. Navigational mistake number 1! By the time I came out of the water for a second time I was probably a good 5mins down on the leader and well down the field. Out on the bike I was not feeling fantastic and quite happy to sit at my slightly conservatively planned power (around 310W). I was still moving through the field pretty quickly, that was until I made navigational mistake number 2. There were some other signs on the course for a local TT. I mistook a TT sign for a triathlon sign and went the wrong way at the T junction. One of the benefits of not yet being at the front of the race was that I soon noticed a lack of cyclists up the road to over take so I figured something must be up and did a quick U-turn. Back on the correct course and I managed to almost complete a full lap before navigational mistake number 3. Again, I mistook a TT sign for a triathlon sign! But this time, I was alone at the front of the race with no more cyclists to overtake up the road. As a result I continued on this detour for about 5km before almost by chance finding myself back on the triathlon course (All of this I did without even realizing I had gone wrong). On to the second lap and I managed to avoid navigational mistake number 2 but not navigational mistake number 3. By the time I had finished the bike I had cycled an extra 10km. Doohoo. Still other than a FEW navigational mistakes, I had been really happy with kit, nutrition and the slightly conservative pacing strategy. 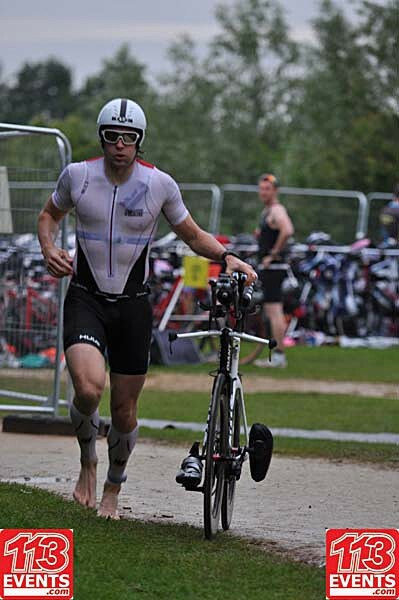 There was only one other bike in T2 when I got there and to be honest I was happy not to see more! Out on the run and I stuck to my plan of not pushing too hard. I held a steady pace and managed to avoid any further navigational mistakes!! As luck would have it, the chap leading the race was not having a great run. There was a 4 min gap but I was slowly closing him down. By half way the gap was down to 1min and I broke my ‘not pushing hard’ plan for just for a couple of km to make the pass and put in a bit of a buffer before slowing things down again for the last few km’s. Back in the car park after the race, I got on the turbo to warm down and reflect on the day. I had won by around 3mins with plenty left in the tank. Kit and nutrition had been spot on. Pacing wise I felt confident I had not overcooked things. So all in all, it was just the start I had hoped for. Despite holding back ever so slightly on the bike and run I still need ALL of the next week to fully recover. Making me question my idea of racing the Cotswold 113 a week on from Bala even more. But first things first and that was Bala. Bala was the first middle distance race I ever did, way back when. It is a hilly course and one that I have always thought does not really play to my strengths being somewhat of a heavy unit. Nonetheless, I went into the race determined to give it everything, and be happy with whatever that gave me. 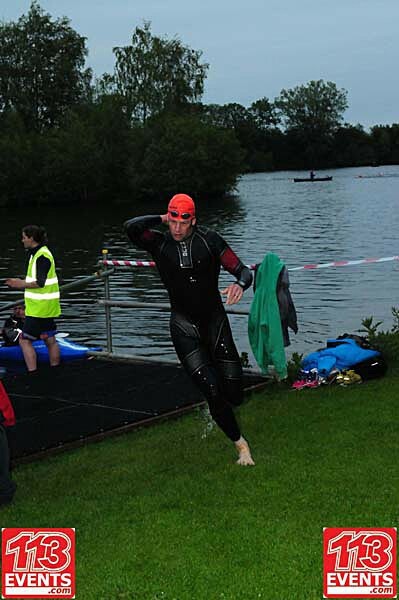 The swim ended up only being 1000m, due to low temperatures in the lake. I was a little annoyed but rules are rules. My swim went OK I guess, but I was way off the pace. 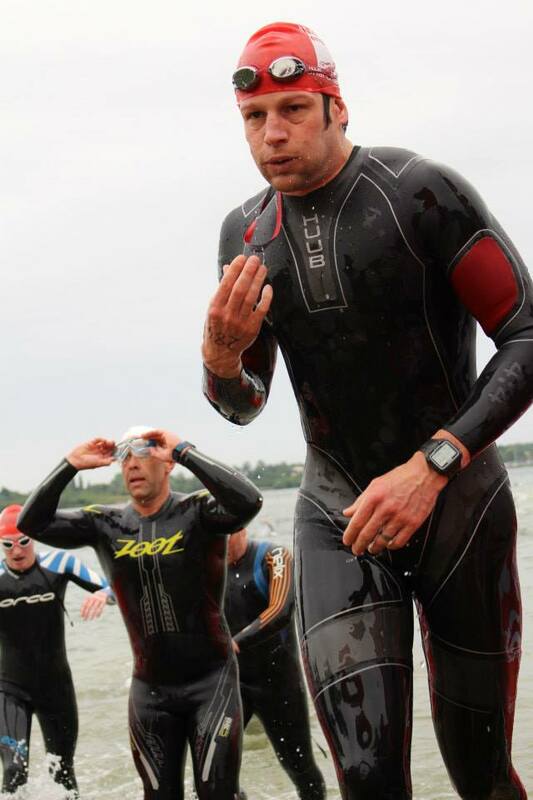 I think I came out of the water around 14th and at least 2-3mins down on the race leaders. On the bike I had a very simple race plan. Hit ALL inclines hard and back the effort off just a little on the downs. I was hitting crazily high power numbers for me. The highest I have ever seen in middle distance racing. I was feeling OK, so I figured I would push a little more and see what happened. To my surprise I felt solid, strong and still not at 100% effort. I love moments in sport like this when your body finds new limits. Today was one of those moments. As I reached the top of the final climb I had managed to build a pretty solid 2-3 min lead. From this point it was around 15-20km down hill to T2. Downhill was where I seemed to be making up the biggest inroads, so I would have hoped to entered T2 with maybe a 3-4 mins lead. However, as many within the triathlon community now know – an incident out on the course brought all road traffic to a stop and no cyclists were allowed to pass. Myself and a large number of the people racing, waited for 30mins or so before being allowed through. In my mind the race was over. We entered T2 in a group and explained to the organisers what was going on up the road. It was felt by myself and many fellow athletes, that the race should be cancelled. It was. It transpired that the person involved did not make it. It was an incredibly sad, somber and sobering day. My heart goes out to all the friends and family of the athlete involved. So Bala was not the day anybody racing had imagined and it made me really stop and think about what’s important in life. The following Sunday at the start line of the Cotswolds 113, my mind was in a far more thoughtful and reflective place than a normal race morning. I think that is the best way I can describe it. Anyway, I had a pretty good swim. At least I felt smooth and strong in the water. I came out in first place and had felt very comfortable. Good start. The plan on the bike was simple. SMASH IT! No holding back. After Bala, I wanted to see how hard I could push on the bike. I had hoped to go sub 2hrs, but had to settle with 2hrs 03mins. It had been a wet slippery morning. Not the fastest conditions. The reason for pushing extra hard on the bike was simple. I wanted to put my body out of its comfort zone and just see what would happen. The run course was three laps and I had it in my mind that I would hold a steady pace for the first two laps. If I was feeling good, I would to increase the pace for the final lap. I actually felt pretty good for the first two laps and so as planned I upped the pace at the start of the final lap. After a couple minutes – boom, my heart rate spiked from 165 to 220 bpm!! I know watches sometime give you crazy readings, but I was feeling really strange, so I slowed to a walk and manually checked my heart rate. It was going too fast to be able to count properly but it was definitely north of 200!!! It scared the hell out of me. Not enough to make me stop racing, but I have never been that sensible when I have my race face on. I walked to a short while until my heart rate had come back down to below my supposed ‘MAX’ then jogged the remaining 6 km keeping my heart rate down in ‘normal’ regions. I came home in 4hrs 03mins to win by about 4mins. I had mixed feelings immediately after the race. My main concern was the stupidly high heart rate I had just seen while racing, so I headed straight to the medics tent to be checked out. After being given the all clear and speaking to them in some detail I felt a lot better about the spike in heart rate. It had been an interesting day. I had wanted to see what would happen if I pushed it really hard on the bike. Well, what happened was my heart just couldn’t keep up with the intensity my body was putting it through. I am sure that there was an element of fatigue from the race in Bala the previous weekend that also contributed to the onset of this mega spike in heart rate. That being said, the rest of my muscles were still feeling pretty good. I think this is the first time that I have found my heart to fatigue before some other muscle in my body. But then again, this is the first time I have ever tried to do some many races back to back. So I guess it is hardly surprising, when you come to think about it. But the whole reason I came up with this crazy series of races, was because I wanted to test and push my limits. Not back off at the final hurdle!! IF…. my body is able to absorb all of this high intensity overload, maybe, just maybe I might be able to hit the same power numbers at Grafman as I did in the Cotswold 113, but this time be able to hold it together for the full duration of the run. I had a really poor swim. Everything felt hard. I found myself swimming in a far from straight line and generally just feeling like I was going backwards, and fast. I must have come out of the water 5 minutes down on the leaders and way back in the field. Not a good start. Out on the bike and I felt much better. The power numbers were where I had come to expect them to be. I put my head down – let the chase begin… I was making good headway on the guys up the road and after about 20mins I had moved from 22nd into 3rd place. Another 20mins on and I moved into 2nd place. At the 1hr mark I come to a U-turn. As I retraced my steps back up the road my mouth dropped open. Behind my lay a long pace line! I had just assumed, given the speed at which I had overtaken everyone, that they were long gone. I had not once turned to look behind me, which turned out to be a VERY BIG mistake. Option 2. Put your foot down and loose these guys. By the next turn around I think I had 1 minute lead. But the next lap was heavily congested with competitors and traffic. I believe a couple of strong riders leading the pace line behind me were also trying to get away, but not having much luck. All this meant I was loosing valuable seconds to the chasing group. Add to that the ‘relay cyclist factor’. The only person to put in a slightly faster bike split than me was this ‘relay cyclist’ who came through the field towards the end of the bike. With him he brought the pace line I had worked so hard to shake!! So with 20mins left to ride I was back to square one! ARRGGGG. As this guy took the lead from me I actually managed to make a smart tactical move!!! I waited. Allowed a biggish gap to open up before surging back up to join him. This actually worked and only one other rider went with this move. We put 40 seconds into the pace line behind coming into T2. The power numbers had been higher that in the Cotwold 113! I had put it all out there on the bike and had a slim 40secs on the rest of the main field to show for it. As I said to a few people after the race – “This was not the race for strong bikers!”. IT WAS ALL DOWN TO THE RUN. I started the run running along side Kit Walker (the other rider who had gone with my move in the dying stages of the bike). He was breathing harder than me and I slowly pulled away from him over the first few 2-3 km’s. But at the same time the first of the speedy runners came flying past. I tried to surge to go with him and actually stayed close behind for a km or two. But then I got passed by a couple more speedy runners and I could feel the race slipping away. At this point I tried to ignore the race around me and focus on my day, running to the best of my ability and letting the rest go. AND…. I did just that. I held my run together all the way to the finish line. No crazy heart rate spikes, just a solid run performance. I crossed the line 6th and was happy with the performance my body had put together on the day. Looking back over my MIDDLE DISTANCE MADNESS, I can honestly say I got everything I could have hoped out of the experience. To me, it was as much about the exploratory nature of this race series as the results that may or may not have followed. In this case they did not ALL follow, but I proud to say I loved the process of it all nonetheless. What happened out in Kona? This is a question that has gone around my head endlessly. Looking back on the race, in the days that followed I could only explain my poor performance by my body’s inability to cope with the extreme heat. However, this did not sit well with me. I had put so much effort into trying to adjust my body to the heat in the build up to the race and it had been working well. My body was adapting I was making major improvements in the heat training sessions that I had done. I found it hard to believe that after all that effort I still ended up melting out there, but short of another explanation, this was the best I could come up with. Eight days after the race I was still feeling utterly shattered. Something was not right so I popped into the doctors for a quick check up. It turned out that I had shingles. Which, for me ended up being a few sores on my forehead, unusually low energy levels and swollen glands around my ear. The drugs I was prescribed knocked it on the head pretty fast, but here is the question that has been with me since then. Did I have shingles before the race, or did I get shingles as a result of the trauma I was exposed to by doing an Ironman in temperatures that my body could not cope with? The logical answer to this would be the latter of the two scenarios. However, if I look back on the week building up to the race, I was already starting to show symptoms of shingles, in the form of few raised bumps on my forehead that eventually turned into the sores you associate with shingles. The thing is, in my search for an explanation, it could just be my mind trying to find any possible sign, however tenuious, that could confirm I had shingles before the race and thus an explanation for the days events as they unfolded. At the end of the day, it could just be my mind playing tricks on me and I honestly I don’t think I will ever know if it was shingles or the heat out in Kona that broke me. I will just have to move on and let that one go. I have a tendency to lose perspective on things sometimes, and let my drive to succeed blur things. Adam Moore wrote some very kind and wise words after my last entry – “When I saw you were on your way Kona it did put a smile on my face and despite not knowing you that well I felt my self really egging you on to have a good race. So despite the fact you are not entirely happy with the result (when are we ever!) I think on this occasion you don’t need to worry about it, because in my eyes you have won.. because after this incredible 17 month journey, you got to kona, completed the race and got the girl!!!”. Adam, thank you for that reminder and help to keep things in perspective. Like you said; after that crazy crash in Lanza, I made it to Kona, completed the race, AND GOT THE GIRL!! Things don’t get much better than that. So where do I go from here? For me, the whole reason I ended up doing triathlon is because I truely love getting out there pushing my limits and enjoy every second doing it. So I am going to carry on doing just that. 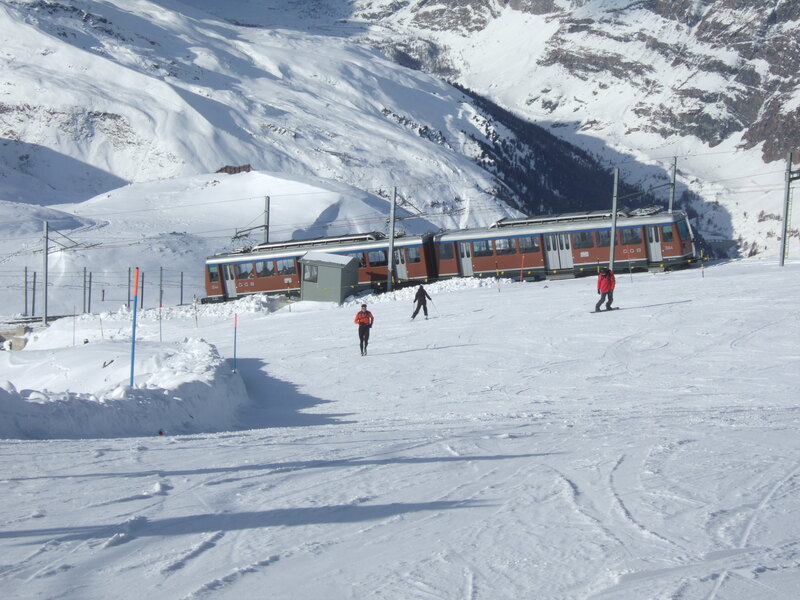 Over Christmas and New Year I am heading out to Zermatt again with my family. Last Christmas I ran up and down three ski mountains in 6 hours. However, it was only midday when I finished. There was still a good 4hrs day light to play with so why stop at three? 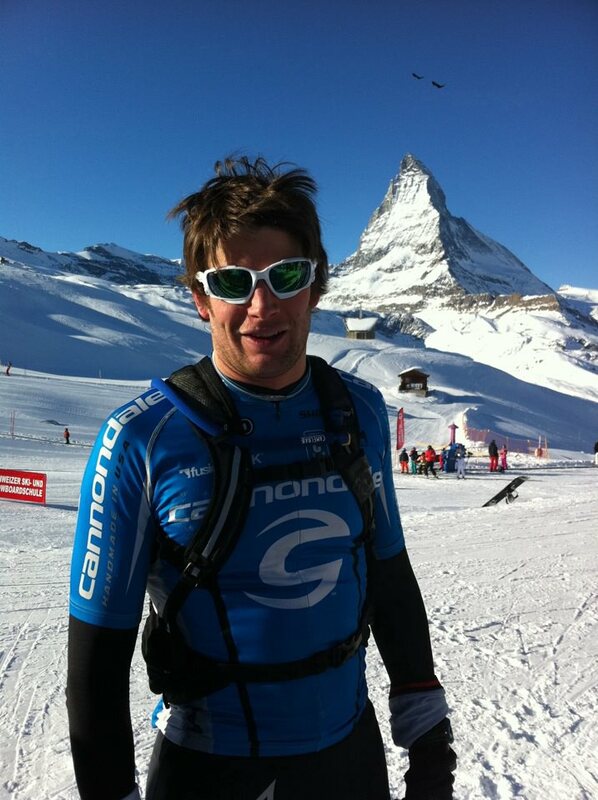 There are five skiing peaks in Zermatt and this Christmas I going to try and run up all of them in one day!!! The ‘ZERMATT FIVE PEAK CHALLENGE’: Rothorn (3103m) – Hohtalli (3286m) – Gornegrat (3090m) – Schwarzee (2583m) – Kl Matterhorn (3885m). It is a crazy idea, I know, but I get excited at the very idea of this. I will need to leave the chalet at around 4am and will probably reach the first peak around sunrise. How cool does that sound!! I have run up all of the peaks before and kind of know what to expect. But like all of these crazy things, it is the journey and the unknown of it all that makes it all worth doing. Can I make it? Probably not, but I learnt a very long time ago, NEVER say NEVER. For those of you that know me well, you will be aware of my love of running up mountains. It all started about 5 years ago. I was in Zermatt for a skiing holiday and a friend of mine suggested we ran up the ski run for a laugh.I had been used to running around the village and down the valley on the roads. 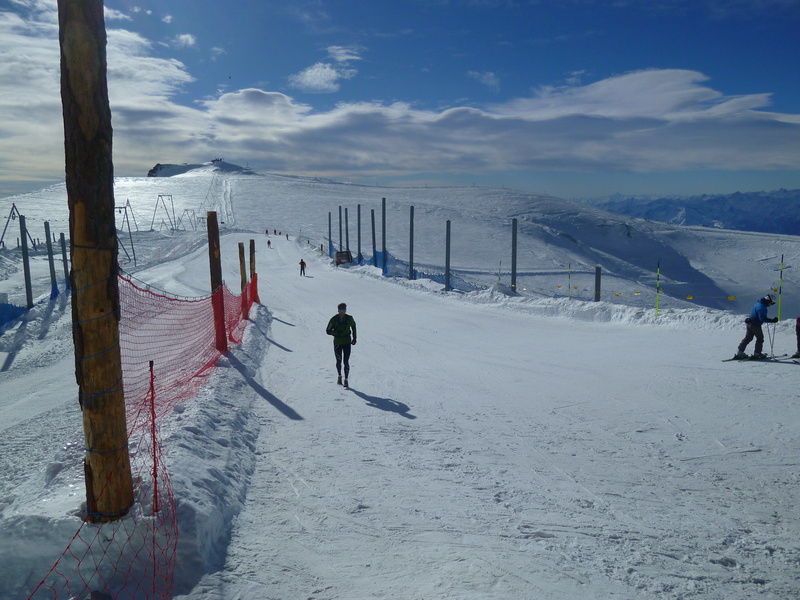 It had never occurred to me that you would be able to run UP the ski runs. As it turned out it was surprisingly easy to do. During the night the snow bashers come out a groom the runs. This leaves the runs in a perfect condition and provides a pretty decent amount of traction, even with regular trainers. From the very first run up the mountain in Zermatt I was hooked and five years later words can’t really describe quite how much I love running up the Zermatt peaks. 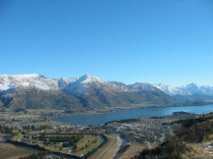 Try and imagine you are in the mountains, surrounded by snow covered peaks and stunning views in every direction. The sun has not quite come up yet, but there it just enough light to soak up the view. The whole mountain is silent with a sense of calm. The air is so cold you can feel every breath enter your lungs as you leave the warmth of the flat. As you start the run the severity of the slope hits hard. The only way to approach the run is one step at a time. As you slowly start to climb the mountain the sun rises and begins to kiss the peaks. It is truly stunning, and moments like that make me feel alive to the very core. It typically takes me about 45 mins to emerge through the tree line and by then the sun has started to spread over the slopes. With the sun comes a surge of new found energy, for a while at least. The final push for the top is always a tough one. With the top in sight I always put in one final effort in an attempt to beat my previous PB. Something I am still managing to do, to my surprise. 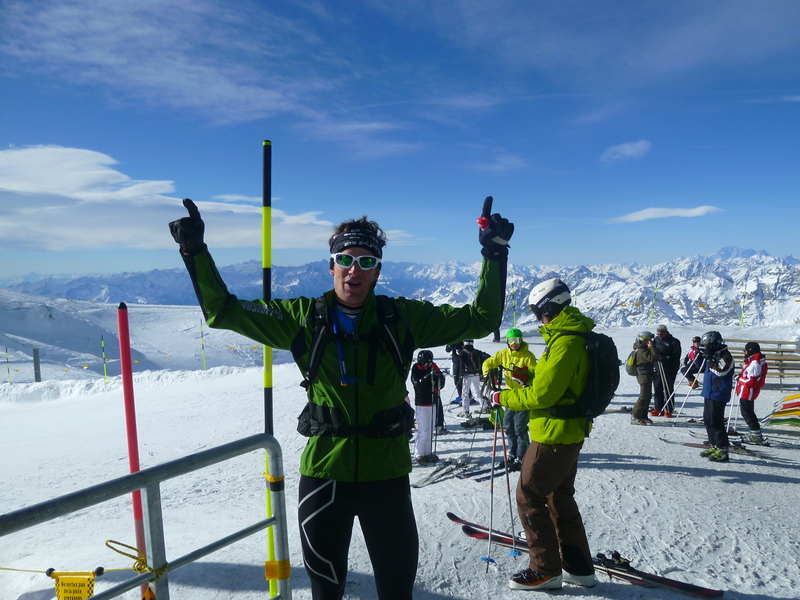 I think my first run from Zermatt (1600m) to Gornegrat (3100m) took me 2hrs. Today my current PB is 1hr 39mins and dropping. To be honest the time is irrelevant. The views from the top are breath taking to say the least but running up somehow magnifies the view, making it almost magical. This Christmas I found running up stupidly easy and started to think a little outside the box. Why stop at one mountain? 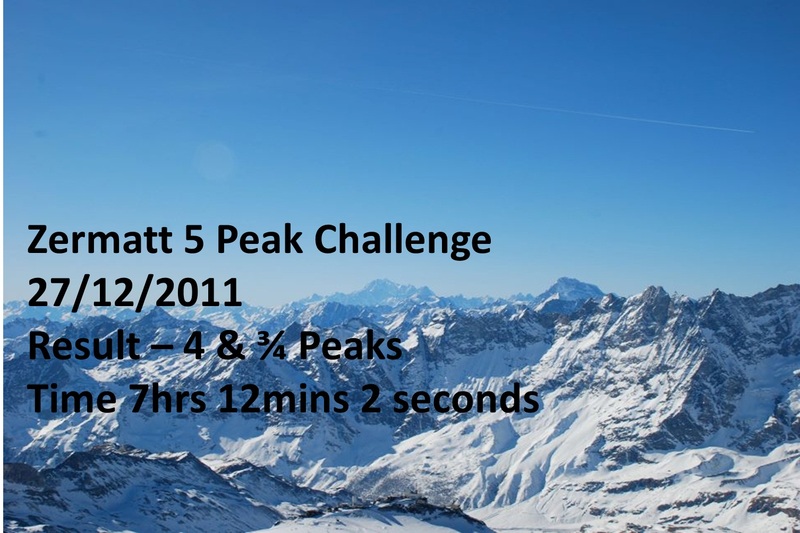 The ‘ZERMATT THREE PEAK CHALLENGE’. The plan was to run up to Rothorn, down to Gant and then up to Gornegrat. From there I would head down to Furi and then up to Trockener Steg. Strictly speaking the top of the last peak is Klein Matterhorn, but that is another 700m up and if the weather changes, causing the lift to close, the only way back down is by foot! Not ideal to say the least. So Trockener Steg (3100m) was my last ‘PEAK’. The run would involve climbing 3300m and to be honest I had no idea if I would be able to get close to finishing it. The way I figured it, I would just give it a crack and enjoy every second out on the mountain. 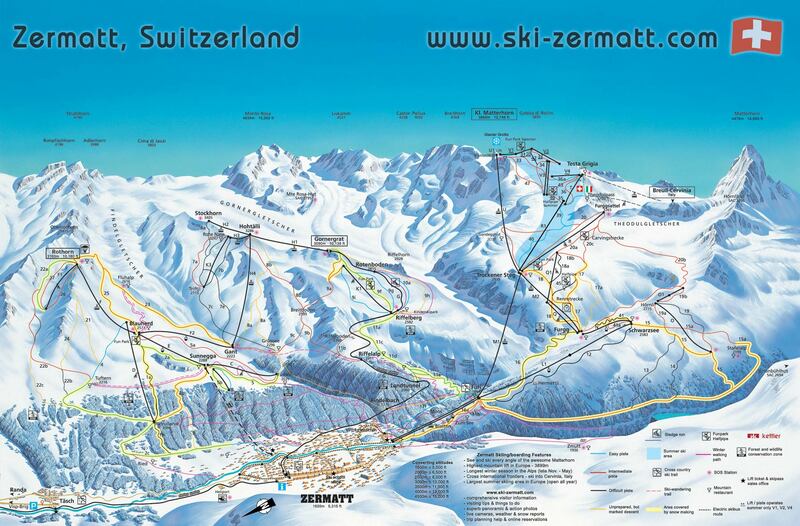 Below is a map of the ski area. I set out on a perfect day; clear skies and fresh temperatures of around minus 10 DegC. 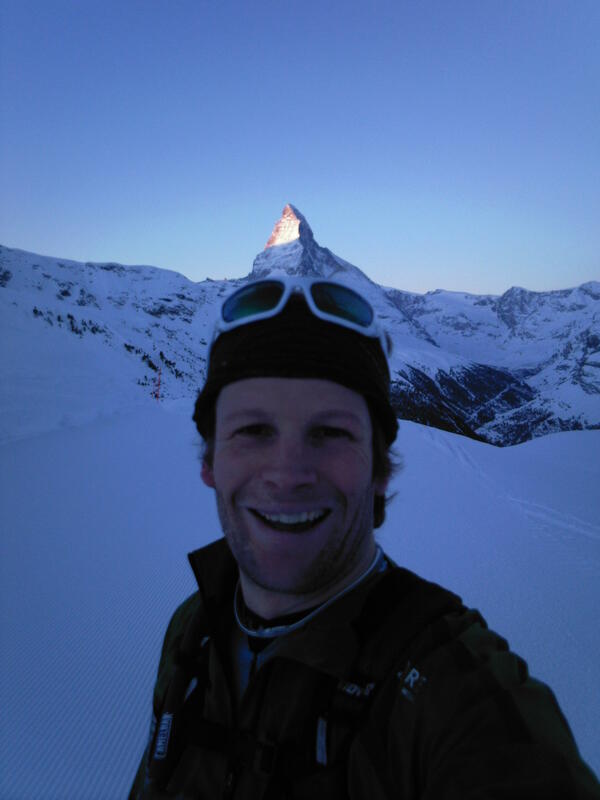 The run to Rothorn was an easy two hours and at the top I was feeling good and pretty positive about making the three peaks. On the way down to Gant, the descent was steep and tough going on the legs. By the time I started up to Gornegrat (2hrs 30mins into the run) my legs were starting to feel it. I just put my head down and thought about the next few steps and soaked up the views. I made it to Gornegrat in just over 3hrs 30mins. By this time I had decided I would just head down to Furi and calling it a day. An hour later I was at Furi. My legs were shot and my mind was set of calling it a day. This is where my stubborn nature kicked in. I was broken and in no shape to attempt the 1100m climb to Trockener Steg. But it was only 11.30am and it did just not feel right giving up. So what did I decide to do? Crack on up the mountain! The next 1hr 30mins was tougher than any ironman run. The slope was an icy black run full of people skiing down! I have to admit, on a number of occasions I thought to myself ‘what the hell are you doing?’. My sole focus became my next step, and this consumed my every thought as I slowly climbed the slope. It was 1pm when I reached Trockener Steg and it had taken me just under 6 hours. I can still not really believe I managed the whole thing. When you think about it, it seems crazy. I think that is the key with challenges like this. You don’t think about it, JUST DO IT! Carli was there to meet me and that made it the trek up the three mountains worth every step. We had an awesome lunch in the sun and trust me, food has NEVER tasted so good. Looking back on the run, I think I could have made the final push for Klein Matterhorn (700m up). A small part of me even considered it at the time, but only a very small part! That will have to wait till next time, but for now ‘that’ll do’. This is really turning out to be an unlucky year for me race wise. The Trans Rockies Run turned out to be a very different experience to that which I had imagined. The trip started out well with a smooth flight and travel up into the mountains. I was feelling well rested and ready to push it hard over the coming week. That is certainly what I did, but not in the manor I had planned. The day before the race I came down with a serious stomach bug and was pretty much unable to get out of bed. Just walking the 500m to the race registration was more that I could handle. 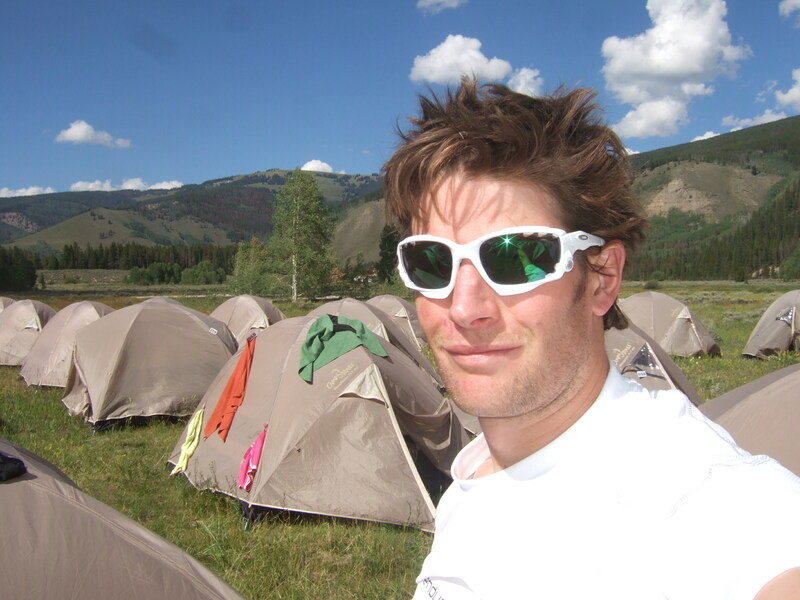 The next morning I was feeling a bit better and positive I would be able to race. This was not the case. It became quickly apparent that I had very little to give and after about 6 miles I felt like I was at the end of an Ironman which had gone badly wrong. I put my head down and struggled on through most of the run, but at mile 17 I pulled out of the stage. I was well and truly broken and thought that if I wanted to stand a chance of completing the race I needed to call it a day. The rest of the afternoon was a blurr and I think I passed out in my tent pretty soon after reaching camp. I had not been able to eat a thing! Never a good plan for a multi-day race. Morning two of the race and I was feeling considerably better. I tried to eat some breakfast but found this almost impossible. Still, in my warped sense of reality, I was feeling positive I would be able to race. Day two was only 14 miles and despite the 900m of climbing I was hopeful I would not be holding my team mate back too much. I actually managed OK on the climb, and while I was only at around 40%, we made good progress relative to the other teams. The descent was hard work for me as my legs were just dead weights. The last 3 miles were relatively flat but it took pretty much everything I had to give to keep on running. We crossed the finish line probably 15 minutes slower than my team mate would have hoped, but I was amazed to be crossing it at all. Again I felt like I was at the end of a Ironman gone very horribly wrong! Back at camp I tried to eat, but the little I was able to take on was just going straight through my system. Still in my mind, I convinced myself I would be OK to race the 24 miles ahead of us in the morning. Day three ended up being the toughest day of the week. My body was truly broken and as we jogged down the first hill I knew it was going to be a very long day. Nonetheless, I managed to make it through the first 10 miles in reasonably good time. Then the wheels well and truly came off. My stomach was so bloated I could barely jog and I could not really take on any food or drink. The next 14 miles was a case of survival and simply making it to the finish line. After quitting on day one I really did not want to repeat that again. In the last mile I think I must have needed at least 4 loo stops. Not a pretty sight and by the time I crossed the finish line I thought that my week was well and truly over. I could just not imagine myself making it to the start line for stage 4 of the race. Later on in the day I was able to eat my first proper meal for 4 days and the temporary cap on my front tooth fell off in the process. Eating a dorito of all things!!! Anyway, during the evening I was given the chance to swap team mates and race with a girl called Leslie. The idea being that I could take it easy with her at the ‘back of the pack’, while Leslie’s team mate (a stronger runner) could race with Scott and save him from another day waiting for me. Chilling at the back of the race ended up being a life saver. For the first time since I started the race I could actually appreciate where I was and the people racing around me. Both of which were awesome. I think I talked non stop all day and was just loving every second out there in the mountains. I was feeling more like myself with every step and to be honest did not really want the day to stop when we reached the finish. When it did, things just kept on getting better with a pub by the finish serving cold drink and food, which I was able to eat. 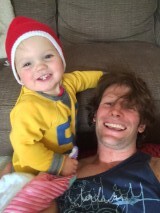 Happy days!!!!! Having eaten a proper meal in the evening I was really much more like my normal self and probably could have raced stage 5 with Scott at a decent pace. However, I did not want to make the same mistake I had done over the first few days so opted to take it easy at the back, as I had done on stage 4. Massive thanks for all the help and support from everybody during the week. It was an amazing event to be part of but was made legendary by the people doing it.